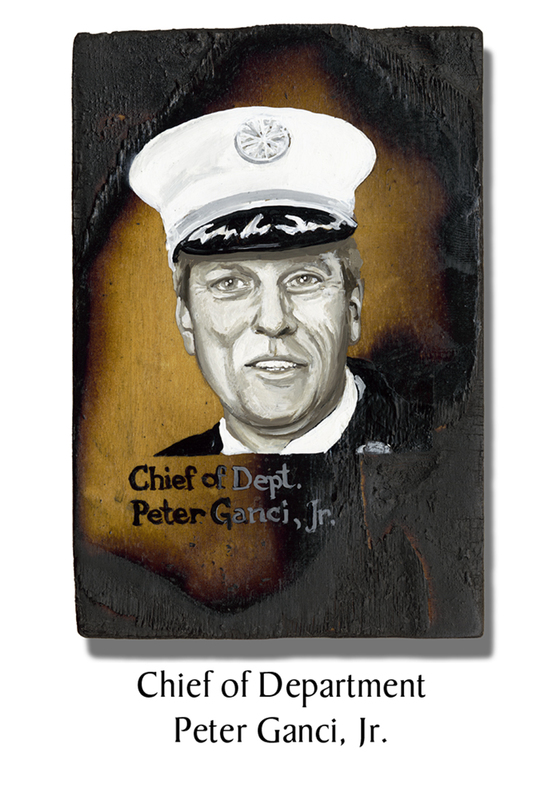 Chief of Department Peter Ganci, Jr. was the highest-ranking uniformed officer in the FDNY. He was three days shy of his 33rd anniversary with the department. This “smoke eating guy,” was a fireman’s fireman and beloved by his men. In 1982, while serving as a lieutenant at Ladder 124, Ganci was awarded the B.C. Frank Tuttlemondo medal for rescuing a child from a burning apartment. Knowing children were trapped, Ganci and his men were determined to rescue them. He watched for an opening in the flames then leapt into action when he saw one, scampering under the wave of fire. Throwing burning furnishings out of his path, Ganci pushed on. Halfway through his search of the second bedroom, Ganci found the lifeless form of a 5 ½-year-old girl, scooped her up, and headed for the front window. “Positioned between the hose line and the fire, Ganci absorbed unbelievable punishment because of the fan-like effects a hose line has on a fire.” He began mouth-to-mouth on the girl then handed her over to another firefighter and returned to the fight, assisting with the removal of another victim. On 9/11, Ganci was on the scene before the second plane hit, directing rescue operations. As the first tower collapsed, Ganci and others ran into the garage of the World Financial Center. Rubble caved in on him, but he dug himself out, exited through the rear of the garage, and went back to West Street, directing firefighters and civilians north to safety. Safety Chief Al Turi was with or near him up until about five minutes before the second collapse. Ganci was heading north, then turned and headed south again. “I’m sure he heard something on his handie-talkie and he was going to attend to it,” Turi said. Ganci’s body was found within the first hour after the second collapse, buried under about four feet of debris. Feehan was found soon after, about 20 feet away. This father of three had one son follow him into the FDNY. This entry was posted in Better Angels Stories and tagged 343, 9/11, better angels, Dawn Siebel, FDNY, firefighter, firefighters, firefighters of 9/11, LODD, Manhattan, memorial, NFFF, Peter Ganci, portraits, World Trade Center, WTC. Bookmark the permalink. One Response to Chief of Department Peter Ganci Jr. I did not know Chief Ganci on a personal level but his son was in my Probie School class, and the chief was very courteous and professional toward me each time I met him. I am proud to say that I served under his command. On the morning of September 11, 2001, I had teamed up with a firefighter named John Ceriello of Squad 18. We had endured the first tower collapse and were separated from the two other firefighters in our group, Mike Macko of Ladder 8 and Howie Scott of Squad 18. Ceriello and I met Chief Ganci and Commissioner Feehan at the entrance to the World Financial Center’s garage on West Street where the Chief ordered Ceriello and me to respond to a report of a firefighter missing. He said, ‘I have a report of a guy missing. A firefighter! (he exclaimed). He’s the chauffeur of 65 Engine. Go find him.” I did not find that man, Firefighter Armando Reno until after the second tower had collapsed. I credit Chief Ganci with the saving of Reno’s life, and I thank Lieutenant Jerry Murtha and all the other guys who helped me get Reno removed from beneath the rubble. I will always remember Chief Ganci as a chief who looked out for the best interest of his men. He loved his firefighters, and many of us today are alive and well because of him and his superb tactics and decision-making. I have been telling others about my 9/11 experience and I never fail to credit Ganci with saving my life by a decision he made that day and one specific order he gave to me directly. He will be greatly missed. RIP Chief.